A BRITISH RAF squadron was seen by multiple witnesses swarming an area of coastline that had been plagued by mysterious UFO sightings, Express.co.uk can exclusively reveal. The case of the Wilsthorpe Incident is being investigated after a number of witnesses to the bizarre events along a 25-mile stretch of the East Yorkshire and North Yorkshire coast were discovered. Witnesses reported seeing strange lights, and odd-shaped craft in an area from Brandesburton in East Yorkshire to Scarborough, North Yorkshire, between May and September 2009. In some cases UFOs were seen entering the sea, and cars ground to a halt as one appeared, it is claimed. Two Chinook helicopters full of RAF personnel landed at the beach by the remote hamlet of Wilsthorpe, East Yorkshire, on Tuesday, September 15 2009, at the height of the sightings, paranormal researcher Paul Sinclair has revealed. It was the day after a bizarre late-night sighting of between 30 and 40 UFOs in the same area by an elderly couple whose home overlooked the beach, he said. The multiple UFOs sighting followed a spate of other strange UFO sightings along the area of coastline, Mr Sinclair told the Outer Limits Magazine 70 Years of the Modern UFO Era Conference in Hull. The military action and UFOs were witnessed by the couple, two bait diggers, and a boat worker, a seven-year investigation by Mr Sinclair has discovered. A pink UFO image sent to Paul Sinclair in 2009 during the height of the sightings. A local newspaper report written more than a week later on September 24 said up to 50 people had seen the military arrival. The case began in 2009 as Mr Sinclair recorded several UFO sightings in the area on his former website ILF-UFO. He also video recorded high levels of military aircraft flying low and circling near his home in Bridlington, East Yorkshire, on September 18 that year. It was not until 2014 when he interviewed the couple, aged in their 80s, about their experience in 2009, that he realised it was one of the UK’s most important UFO incidents. The couple lived in one of 30 flats that overlook the sea at Wilsthorpe. Mr Sinclair told the conference that the woman described seeing on September 14 2009 15-feet long and eight-feet wide “spaceships over the sea”. The remote flat from where the elderly couple claimed to see up to 40 UFOs. The woman said that after about half an hour, the “craft” flew off. The next day the couple said they saw the military swarming all over the beach. Mr Sinclair, who continues to investigate the case, has collated a record of other UFO sightings in the area from at least May 2009 that were either reported in local newspapers or directly to his website. These include a pink flying saucer and three star-like objects over Flamborough Head, east Yorkshire, on May 10 2009, a huge UFO over Driffield six days later, and a “spherical-shaped craft” seen by nine people at River Head three days after that. Sketch of ‘crucifix-shaped UFO’ seen by retired police man David Holroyd, who saw three UFOs. He revealed sightings that continued throughout June and July, including spheres of light over the sea, plus triangle, circular, and egg shaped craft. Witnesses included trawler men and a retired police officer. He also had reports of cars stopping working after a UFO sighting, including a black triangular object. The vehicles worked fine again after the UFO flew out to sea. These included an off-duty police man driving back from Barmston, East Yorkshire, whose car lights dimmed after a large tube-shaped UFO appeared. Mr Sinclair said witnesses, including himself, also saw unusually high levels of military aircraft in the area at the peak of the sightings spate. He said RAF helicopters had flown exceptionally low over his home at times, including when he recorded them three days after the military presence on September 18. He said: “Why were these planes there? What was so important at the time? “Does that mean there was a UFO presence, no, but it means there was a military presence. 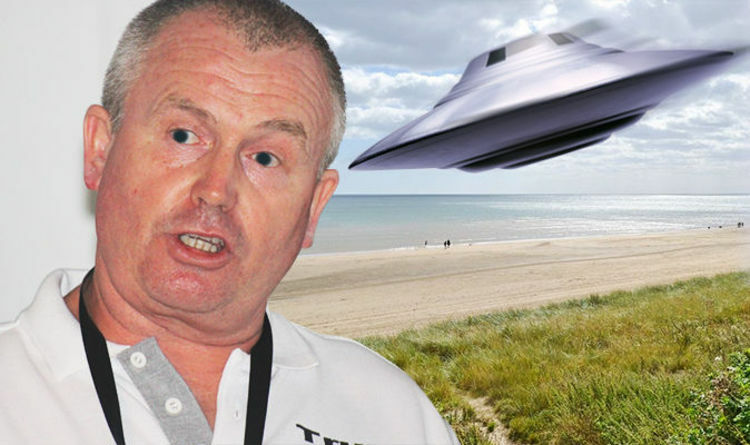 Picturesque Wilsthorpe beach was mobbed by military after alleged UFO sightings. He continues to investigate the case and is trying to obtain historic coastguard reports from the period. In a post on his Truth Proof Facebook page about the case, he wrote: “When I filmed the helicopters I had no idea there would be any connection to a UFO incident. “So far it has taken seven years to connect these events, mine and the people who have been bold enough to submit their accounts. “As a collective they tell an amazing story that if true stands with the great UFO incidents of our time. “Nothing found can prove with any certainty the UFOs were over the sea as an elderly couple claim, or that the black triangles entered the sea in September 2009 like the bait diggers described.